SONOS. Have you heard about it? Have a look over the word again. No matter if you read it from left to right or vice versa, it always says SONOS. Moreover, it traces its roots back to the Latin word “sonus” which means “sound, pitch”. Have you got any clue now? ..set out with a goal – to reinvent home audio for the digital age. Their vision was simple – fill every home with music and make listening a valued experience again. 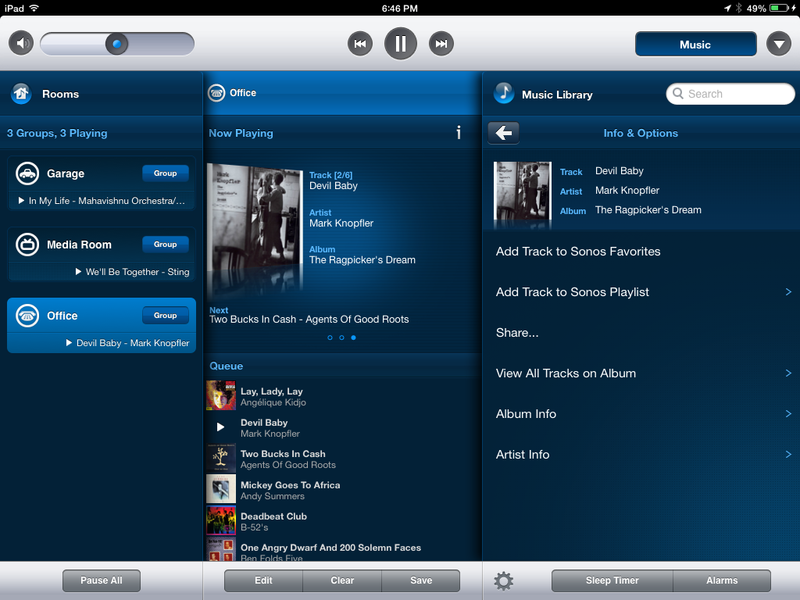 SONOS are making it easy for everybody to listen to the music they love in every room of their home. To hear the songs they love, to discover new music they never knew existed, and to appreciate it all with the highest sound quality. Strong words from a cool company indeed! That’s what I thought when I first had a look at their website. I browsed through the product list and I thought to myself: “I want to put my hands on one of these devices”. Soon, I was able to – I had a SONOS PLAY:1 sitting on the table in front of me. Unfortunately, it wasn’t mine, it was borrowed. But nevertheless, I had it “reserved” for myself for enough time to get in touch with it and give it my love (yep, I was really keen on rustling with this cool gadget – remember my passion for smart technology and music? Here I could find them combined in one place). So, let’s get cracking and see what’s what with the SONOS PLAY:1. The PLAY:1 can be referred to as the baby SONOS, since it is the smallest in their whole range of multi-purpose smart speakers. And, for sure, it is relatively small compared to its bigger close relatives – the PLAY:3 and PLAY:5. All the speaker components are fitted in a body with dimensions of 12 (width) X 12 (length) x 16 (height) centimeters, which has, as the measures probably hint, a cuboid shape with rounded edges. These cuboid-like shape, together with the rounded edges and the flat bottom and top actually caresses the eye. The speaker is provided with two little buttons on the top – for setting the volume level and for playing/pausing the currently loaded song, together with a simple multi-color LED light (showing different events and statuses), so, in terms of interface, the SONOS designers have decided to get rid of as many buttons, displays and lights as possible. The design can be shortly categorized as minimalistic because of these simple but yet stylish and beautiful shapes, the lack of numerous buttons and the fact that the only available colors are white and black. SONOS PLAY:1 is a lovely little thing which will fit perfectly in any room of your home, no matter if the surrounding styling is modern or vintage. In terms of build quality, personally to me the PLAY:1 really stands out, especially compared to its bigger brother – the PLAY:3 (where, it hurts to say that, but, the materials are not so good). First of all, when you grab the PLAY:1 and pick it up, it is heavy, bringing a feeling of solidity (this really appeals to me). Furthermore, the speaker is made of really high-quality matt plastic (at the top and bottom ends) and a pleasantly fabricated metallic mesh around the speaker’s circumference. I share the opinion that the build quality of a speaker can be tested at high volume levels, because that’s where the badly made speakers begin to vibrate, crackle and make you feel sick of side noises. The PLAY:1 scored excellent in this category, because even at really high volume level the only thing you can hear is music – no crackling, no nasty noises of cheapness. Another detail which states that the SONOS PLAY:1 is a high-quality product – the two buttons (mentioned above) behave really good on clicking, they are just nice to be clicked (I know this sounds funny, but it’s a fact). So – another win for the SONOS PLAY:1! Now, ask yourself the following question – do you think that such a small speaker can sound good through (not the whole but most of) the sound frequency range? You have probably answered “no”, but, actually, you are wrong. The PLAY:1 delivers an outstanding sound quality for its size, covering both high and low sound frequencies and having real sound power for the small measures it has. On the inside, PLAY:1 has a tweeter fitted, as well as a mid-range driver (each has its own amplifier), which moves in a cone way much more than other speakers of the same size and more cone movement translates to more air movement, thus giving more voluminous sound. Of course, the PLAY:1 cannot cover low bass frequencies as a real sub, as well as it is not the best performing high-pitch speaker. But, as a general-purpose sound source, it really will fulfill your needs and expectations. If you are a professional musician, then yes – you won’t probably fall for the PLAY:1. But if you need to provide your home or restaurant with a decent sound system which is good for both listening to music or watching movies for example, the baby SONOS is the right choice. The first thing we need to mention here is that the SONOS speakers in general are wireless and this applies to the PLAY:1 as well. When you open the package, you get the speaker, a power cable and an ethernet cable, the last of which you will probably never use. However, if we neglect this disadvantage, the application is pretty good and provides an easy way of controlling the speakers. At first glance it is not as intuitive as it should be, but when you get used to it, it is pretty cool. A really useful feature of both the application and the SONOS speakers is that you can group and pair them. What this means? If you have more than one speaker present, on a first logical level, you can create a group of speakers, named “kitchen” or “living room” for example. Imagine the group as the room where several devices can be clustered together (the name can be anything you want) and you can have different groups of speakers throughout your home or whatever space you want to provide with music. On a second logical level, though, inside a group, you can create stereo pairs of speakers of the same type. So, if you imagine that your “kitchen” speaker group consists of one PLAY:3 and two PLAY:1 speakers, you can bond the two PLAY:1s together, so that they act as a single player, thus, for example, letting you set the PLAY:3 at a 100% volume, while the pair can be set with a volume level of 50% (each PLAY:1 will be playing at half its power). Even if you have only the two PLAY:1s at your disposal, you can pair them, so then you can double the sound power and, furthermore, each control action performed on one of the bonded devices will be instantly reflected on the other. So far we have been boasting around the PLAY:1’s perfect built quality and the excellent sound abilities for that kind of small-sized speaker, but now we have reached to the point where we must ask the most important question – how much do you have to pay for such a high-quality smart music device? At the moment of writing the article, the PLAY:1 was listed on the official SONOS website at the price of €229. So now it becomes tricky, because, personally to me, it is hard to put a verdict in such a situation. So, whether the PLAY:1 is pricey or not depends on the point of view. If we consider quality and functions per price ratio, it is a real bargain – you buy two speakers, equip your mid-size flat and forget about it. But if we look at the PLAY:1 from the perspective of how big the market of such hi-tech gizmos is, we will come to the conclusion that you can buy not-too-bad smart wireless speakers for much lower price (I won’t give examples, but I’m sure there are less expensive substitutes). So, if you want to have high-quality speaker(s) at home and are a lover of the SONOS brand, this is the choice for you. There’s no other way to say it – the SONOS PLAY:1 is really cool! If you want to bring music to your home, restaurant, café, bar, swimming pool, really everything, and you want a stylish high-quality unit to do the job, then this speaker is a brilliant solution. Yes, it has its limitations, but the quality of sound compared to the compact size is really impressive. If you don’t need high-end DJ equipment, but just require that music and Internet radio are easily accessible and available for you, then it is worth giving these two hundred and so euros for this smart little fellow! It, for sure, is going to be one of your favourite smart devices if you are truly inside the concept of the Internet of Things.